RIR presents a selection of views from leading Russian media on international events, featuring reports on the Moscow's treaty with Tshkinvali, Ukraine's lawsuit against Putin in the Hague and future of Russia-Israel relations. 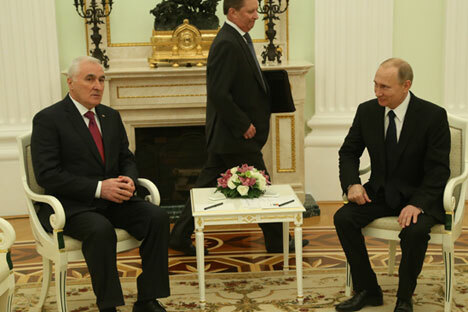 On March 18, Russia signed a Treaty of Alliance and Integration with the Republic of South Ossetia. The treaty will last for 25 years and has the possibility of extension, the weekly magazine Expert reports. The document allows for the creation of a "common space of defense and security, free border crossing and cooperation between the Interior Ministries." The magazine notes that the international community has responded predictably to the signing of this agreement: U.S. State Department Spokeswoman Jen Psaki said that the document does not have the power of international agreements, while the Georgian Foreign Ministry said that South Ossetia remains an integral part of Georgia and does not constitute an independent subject of international law. South Ossetia broke away from Georgia during the 2008 Five-Day War. According to Expert, the strong reaction by Georgia is affected not only by its overall policy towards South Ossetia but also by domestic political concerns. The publication explains that the ruling coalition, Georgian Dream, is both trying to improve relations with Moscow and defend itself against criticism from the opposition at the same time. Expert adds that the new treaty will act as a kind of guarantee for South Ossetia and Abkhazia, which also broke away from Georgia during the war, regardless of how Russia-Georgia relations develop. News website Gazeta.ru reports that the Ukrainian government has filed a lawsuit against Russian President Vladimir Putin and Defense Minister Sergei Shoigu in the Hague. Ukrainian Justice Minister Pavel Petrenko said that the lawsuit concerns statements by Putin and Shoigu on Crimea made in the documentary "Crimea: The Road Home," which aired on Russian television March 15. In the film, Putin said that he personally directed events that took place in Crimea after the change of power in Ukraine. Vadim Karasev, a Ukrainian political scientist and the director of the Institute of Global Strategies, said in comments to Gazeta.ru that the lawsuit is a symbolic gesture that shows Ukraine is not ready to give in and pursue peace at any price. "Not everything is decided by Poroshenko, the political field is highly diversified," Karasev said. According to Karasev, the lawsuit is just the latest indication that Kiev is going to take a tough stance vis-a-vis Moscow regarding the situation in the Donbass. Another indication is the bill submitted by President Petro Poroshenko to the Ukrainian parliament, the Verkhovna Rada, on self-governance of parts of southeastern Ukraine. Karasev said that the legislation – which requires the end of the occupation of the regions before voting can take place and excludes the town of Debaltsevo from the regions to be given a special status – did not go against the letter of the Minsk Agreement, although it did go against its spirit. Karasev believes that one option for resolving the self-governance issue is that Moscow will replace the current leaders of the Donetsk and Luhansk People's Republics, which Kiev might accept as a compromise position. The Vzglyad newspaper summed up Israel’s snap parliamentary elections, in which Prime Minister Benjamin Netanyahu’s Likud Party won a surprise victory. The paper noted that the election results are unlikely to change much in Russia-Israel relations. While Isaac Herzog, the leader of the center-left coalition who was considered Netanyahu’s main competition for the prime minister’s seat, said that he would strengthen Israel’s relationship with Russia should he win, a Netanyahu victory is more likely to produce policies in Russia’s favor, Vzglyad wrote. According to Tatyana Karasova, the head of the department of Israeli and Jewish communities at the Institute of Oriental Studies at the Russian Academy of Sciences, "everything will continue in the same vein of the growth of bilateral relations, as it was in recent years." "Despite the fact that the Foreign Ministry will not be headed by Avigdor Lieberman, who was a strong supporter of strategic relations with Russia, the vector of mutual relations will continue," Karasova said. The election results will further complicate already difficult relations with the United States, especially since the personal relationship between U.S. President Barack Obama and Netanyahu is very difficult, which may also work in Russia’s favor.